Hello, everyone! I have a little something different for you all today. 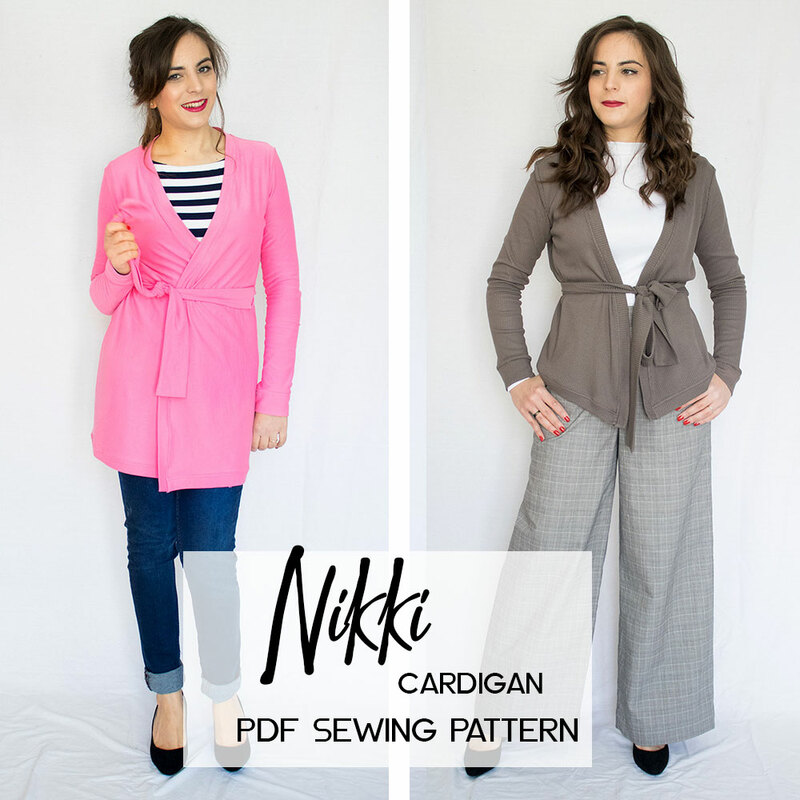 I was asked by Athina Kakou of Athina Kakou Patterns (and the SMYLY movement from last year) to review her Nikki Cardigan pattern in exchange for the pattern. As I had been eyeing this one up since its release in October, I jumped on the opportunity. Let me first say, that even though I was gifted this pattern, all thoughts and opinions are my own and Athina asked that we all give honest reviews. Because I used thicker fabric I cut the width of the tie belt in half and only used the single thickness. This pattern was a very simple sew. I think it took me about an hour to cut everything out and sew it up. The instructions were VERY thorough and a beginner could easily follow along with success. She also does complete sew a long videos for all her patterns on her YouTube Channel that would be very helpful to any new sewist. The pattern features a wrap front that can be worn open or closed with a tie belt. While I love the versions with the tie belt, I think my fabric was too thick for the belt. I will definitely wear this a ton without the belt, but whether or not this gets a lot of wear with the belt remains to be seen. The finishes on this cardigan are very clean. It uses bands for the cuffs, hem and neckband. I really like how neatly everything is finished. For the fabric, I used this amazing double knit from Smuggler’s Daughter. She no longer has this in stock, but does carry a ton of beautiful sweater knits that would work beautifully with this pattern. This particular fabric is actually two layers of knit that have been tacked together. The bottom layer is a marled gray and the top charcoal layer has been tacked in a way that gives it it’s wavy texture. While the fabric is a little thick to be worn with the belt, it makes for a VERY comfortable and cozy cardigan that will see a lot wear this winter. Now I just need a lighter sweater knit so I can also have one to wear with the belt . . .
All in all, this is a great little cardigan pattern that is perfect for both beginners and more advanced sewists. It is definitely worth a look if you’re in the market for some new cardigans! I’ve talked a little bit more about the pattern over on my channel as well!